This is a family reference page ONLY. We have NO further information on any books published by these book companies. You might check with antique book stores to obtain additional information. Founded by two bookbinders, Michael A. Donohue (of Cox & Donohue) and William P. Henneberry. At 407-425 Dearborn 1871; first publishing 1879; in 1890 launched series of inexpensive editions of popular novelists, concentrated on libraries (i.e., sets and series). Some plates sold to Lovell in 1890. Did much job printing for competitors in cheap book trade. Donohue bought out Henneberry in 1903. (DLB 49). Donohue & Henneberry produced Luciles in two formats ("handy volume" and "library-size"), each routinely offered in several bindings. As the firm's 1895 PTLA catalog makes clear, many of the binding styles were also offered, packaged with a second title, in two-volume sets. Known editions are arranged here first by format, then chronologically (as can be best determined). Chicago and New York, 1901?-1919?. "Another printer who became a major Chicago name in the field should be mentioned, although he was not an "old" publisher, with antebellum roots. John Cuneo was, in fact, only twenty-one in 1907 when he bought the bankrupt bookbinding business of Jenkins & George, changed its name to John F. Cuneo Co. and made it so successful that at the end of the First World War, in 1919, he took over the Henneberry Co., a large printing and bookmaking concern, calling it the Cuneo-Henneberry Co. Four years later, he acquired the Sears printing plant and formed a separate company, the Cuneo Printing Corporation, and it was these organizations which became the basis of a printing empire encompassing Chicago, New York, Philadelphia and Milwaukee." (Tebbel). See also Donohue & Henneberry; M.A. Donohue. warpper. Price, per volume, $1.00. [Includes Lucile; cut of four bindings]. including Meredith; Lucile also offered]. appears to be same as New Century Library]. $1.25. 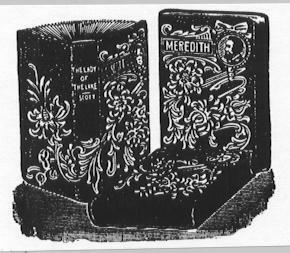 [Cut of three bindings]. of text and rear flyleaf lacking. Mary Henneberry-July 3, 1897, March 31, 1888 Chicago Sun Times. Henneberry Mary nee Reeves, at resid., 23 Johnson St., wife of Harry. nee Burke, mother of Fr. Francis S. Henneberry of St. Pius Church, and W. P. Henneberry of Donohue & Henneberry, printers, died at the residence of the former, 884 South Ashland ave. on June 26. She had been confined to her bed for several weeks, suffering from a complication of diseases which commenced with grip and ended in heart failure. She was born in Cashel, Co. Tipperary in Sept., 1812 and came to this country in 1835. She made her home in New York for two years, and in January, 1838 was married in that city to John Henneberry, an old acquaintence in Ireland. In 1844 the family moved west, coming via the Erie Canal as far as Buffalo. At that city they boarded the steamer "Missouri" intending to locate in Milwaukee, but while on the way changed their mind and came to Chicago instead. For two years the family lived on Kinzie street, removing to the northwest corner of Polk and Clinton where they resided until burned out in the Fire of 1871. Mr. Henneberry died in 1858, leaving his widow with eight children to support. Three sons survive the mother, two living in Chicago and Joseph S., on a ranch in Montana. Those dead, are Thomas H., the eldest, who was superintendent during the Civil War of the government express company, known as Parker's Express, and was stationed at Little Rock, AR; James E., born in New York in 1841 served on the gunboat "Essex" and participated in all the engagements with Admiral Porter. Subsequently he was appointed to a position in the Chicago post office, and later served as Secretary of the Chicago Grain and Provision Call Board until the time of his death in March, 1888. He left a wife and four children. ; John F. who served in the 34th NJ regiment, M.C. Henneberry who was connected with the Chicago Times for 27 yrs., being its commercial editor for twenty years, and the only sister, Mary Elizabeth who died a month after her father's demise in 1858. Since the Great Fire, Mrs. Henneberry has divided her time with her two sons, but for the past fourteen years she has lived with Fr. Henneberry. She was the first member of St. Mary's Church, which was the first Catholic church in Chicago. Funeral occurred from St. Pius Church to Calvary, and was one of the largest witnessed in the city for quarter of a century.